Most of the stuff I've been doing at the moment is top secret so until all can be revealed I thought I'd share some finds which I've discovered recently. I'm not really sure why (or where we'd put it) but I quite fancy a Deer Head Trophy (not a real one of course!) I have seen an origami version which I've thought about trying on several occasions but I saw these recently on my go to for inspiration Design Sponge and just thought they were so fun. 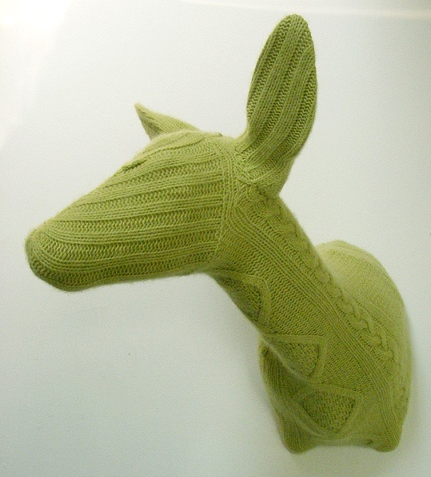 Rachel Denny is best known for her “Domestic Trophies” work, 'deer heads covered in cosy cashmere cable knit woollens and the like. Her work is an exploration of the seductive beauty of our natural world and the imprint that human intervention has made on its flora and fauna'. The animals are totally transformed by the texture and colours she uses into beautifully interesting poetic creatures. She is 'inspired by the elegant forms found in the natural world and by the time honoured action of depicting these forms in a way that is relevant to our modern times'. These pieces are from her solo show at the Foster/White Gallery in Seattle, unfortunately a bit far for me to travel to see them in the flesh but you can find some of her wonderful creations on their website here. You can also see more of her work on her website here. There are some amazing characters, I just adore this fox, so beautifully made and you can really see his personality!